Half of the class participated in a workshop this past weekend! They participated in “Experiencing the Eucharist” at St. Micheal’s. Thank you so much to Karen Holmberg and all of the Motley church ladies who invited us to take part in this wonderful experience! The students had a blast and the other half is very excited to participate in a couple weeks. Pictured below:The students working on making their own homemade bread! Just a reminder that First Communion is on April 18th at the 8:30 Mass. The students are SO excited to receive Communion soon! Thank you to any parishioners who are participating in our “Adopt a Communicant” program! The students are loving getting notes and cards from you and are so grateful for all your prayers! WAY TO GO! 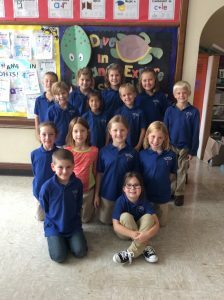 The Second Graders were the top-selling class for our Catholic United Financial Raffle! Their prize is a PIZZA PARTY!! We will be having this party next Tuesday, March 12. We will be having this party for lunch! Catholic United will be providing several pizzas as well as some pop. If they do not like pizza please have them bring a cold lunch or plan to get hot lunch. Great Job Second Graders! I am so proud of all of you! P.S. Tomorrow (Friday, March 8) is our movie day! Your child is welcome to bring pajamas to change into after mass. They can also bring ONE blanket OR pillow. Happy New Year! This month has just flown by. We have been very busy finishing up our Reading unit on creative ideas. We learned about many different ways to solve problems. This week we are working on our compare and contrast essays about Arctic animals! We have also finished up our Math unit on rounding and estimating. Now we are working on using patterns to solve problems. In Social we are learning about the different cultures around the world. We have been comparing and contrasting these cultures as well. The second graders are super excited to be starting our First Communion classes! We had a good discussion about what they are looking forward to and answering questions about the Sacrament. You will be getting more information about First Communion sent home soon. The class worked very hard this week to finish up their NWEA tests. The were very focused and showed a lot of growth! 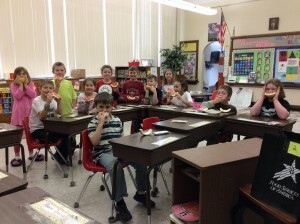 Below is a picture of the class taking a break to enjoy a snack during testing. Keep selling those raffle tickets! We are close to our first incentive, hot chocolate and cookies! They are looking forward to our Color Dance to celebrate all their hard work. Don’t forget, next week is CATHOLIC SCHOOLS WEEK! This weekend are our kick-off masses (5:00 p.m and 10:30 a.m). Please wear your uniform and sit with the rest of the students. Even if you did not sign up to read you are encouraged to come sit with us! There will be spaghetti supper after 5:00 mass and a pancake breakfast after the 10:30 mass to help raise money for the 4th and 5th grade trip to the Audubon Center this Spring! Check out the newsletter that is going out today to see the different dress-up days for next week! We have been working hard in second grade! We just finished learning about place value and number order in math. Next, we are going to learn about addition and subtraction properties. We are continuing to work on our writing skills by writing complete sentences and identifying the different parts of a sentence. This week we have been reading all about the desert. We have learned about the different types of plants and animals that live there. We are very excited about our trip to the fire hall next week! Don’t forget your permission slips! Welcome back! Time is flying in our room so far this year! We are getting used to our classroom routine and procedures and are still figuring out our daily schedules. The class had it’s first music class with Mr. Rohr today and they had so much fun! Music at our own school is going to be wonderful addition, we are so excited! We are starting to learn about Reconciliation and the students are excited to be receiving the Sacrament this year! I will be sending home more information about meetings and dates next week, please keep an eye out! I hope you are all doing well and enjoying being back to school! We had some visitors today! 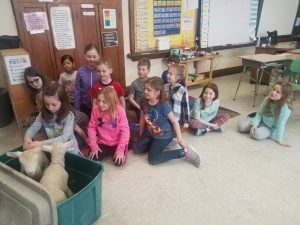 Stella’s grandpa and dad brought in their lambs, Grayson and Lucy, for us to see! The students had so much fun meeting these two! I hope you all had a wonderful Easter break! We have had a great week so far in second grade. We are continuing to work with money and the kids are so excited about their classroom store. I will be setting it up next week and they will be able to spend the money that they saved. In Reading we are working on silent consonants and reviewing theme and plot. The students really enjoyed reading stories about silly puppies and how to train them! 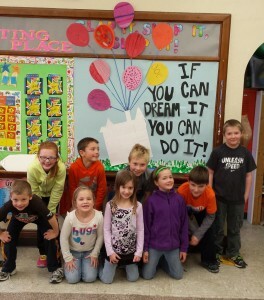 We are super excited to have our Spring Blast project finished and ready to go! I hope to see you all there for some food and fun! Hello Parents! This week we are so busy! We are beginning to learn about wants and needs in Social Studies, working with money in Math, and reading about Helen Keller in Reading. Next week we will learn about goods and services in Reading and begin our classroom economy! 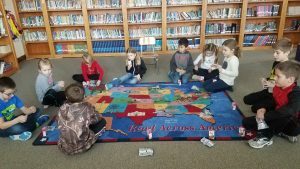 During I Love to Read month the second graders won the library visit challenge! The Librarian, Angela, dropped off dilly bars as a reward! Great job second graders! Can you believe it’s almost march?! We have been very busy in second grade. We are continuing to prepare for First Communion. The students are so excited! Remember to keep working on your take-home booklets, attending mass with your child, and continue talking to them about what the Eucharist is. We have been working with patterns in math, discussing the life cycle of a frog in reading, and will be moving onto our economics unit soon! Happy New Year! I hope everyone had a wonderful Christmas break! We have been very busy in second grade. The students have been working on their addition and subtraction strategies, practicing reading words with the long e sound, and strengthening their writing skills. Today we worked together to create a paragraph to share different ways to be a good friend. Always be kind. Always be a friend and be kind to one another. Always be nice. Be helpful. Always help someone when they get hurt. Don’t bite others and be nice. Always be nice to one another. Don’t be naughty. Give hugs. Be nice to others and don’t keep secrets. Don’t trip others. Love one another as God has loved you. Welcome back!! I hope you all had a great summer break! We are having a wonderful start to our school year! The students (and I) are just getting back into the school routine and are getting our classroom schedule figured out. We have been very busy these last two weeks. We have been working with long and short vowel words, starting to talk about place value, and discussing our community government. Please continue to read with your child each night and to practice their prayers! We are also getting ready to celebrate Grandparent’s Day!! We will be having Grandparent’s Day mass next Thursday, Sept. 28th. After mass all the grandparents are invited to come to the school for some muffins! Can you believe it is almost April?! This year has gone WAY too fast! 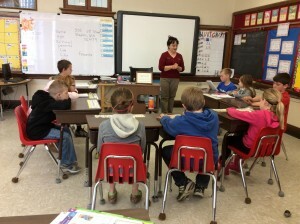 The second graders just wrapped up their history chapter is Social Studies. 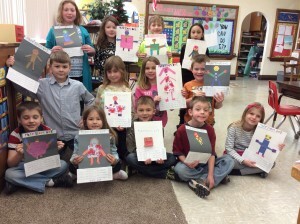 They each picked an American Hero and made a mask to help them look like their person. Then, they wrote a short biography stating who they were, what they did and when they did it. Next, they shared their person with the class and created a living timeline! (middle picture) Now we have started working with good, services, wants and needs. We have a classroom economy for our classroom that they students are participating in. Each student has a job for the day, receives a salary at the end of the day and can give out fines or rewards throughout the day. They are having a lot of fun!! They are doing a great job working with money! The second graders have been very busy! In Math we are continuing to strengthen our addition and subtraction skills with two-digit numbers. In reading Social Studies we are discussing the different cultures that are around the world. We have been working on comparing and contrasting different items in all subject areas. We are getting excited about First Communion! Don’t forget their is a parent meeting this Thursday, March 9th at 6 p.m. at the school. We have been learning about all the different parts of mass and what certain aspects mean. They are working hard and doing great! Happy 100th Day of School! 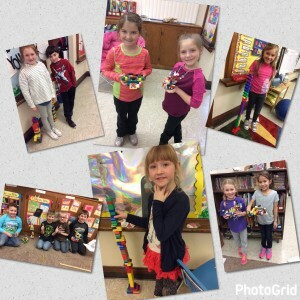 The second graders were each given the task of counting out 100 legos and building with them. They then had to measure their creation, count how many of each color they had and fill in some graphs to document this information. They had a blast! This year has just flown by! We have been super busy in second grade these last few weeks! In Math we have been working with patterns and are now focusing on variables, story problems and creating our own story problems. In Reading we are learning about how to use verbs in different situations. In Science we are learning about matter and having fun with water! We are enjoying having a relatively calm January before the craziness of February begins! Next month we will celebrate Catholic Schools Week, have fun at the Carnival and enjoy I Love to Read Month! Summer is almost here! I can’t believe how fast this year flew by. The students are definitely ready for summer and sunshine! As we approach the end of the year we are doing lots of testing and assessments to see how much the students have learned. 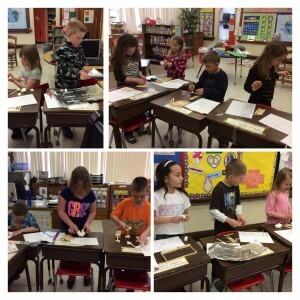 In second grade we are wrapping up Science by practicing our observation skills. We spent some time outside observing nature and the different animals that were around. We are also writing some opinion pieces, learning a little about multiplication and discussing about the different Seasons of the Church. We had a BLAST on our school trip to Duluth. 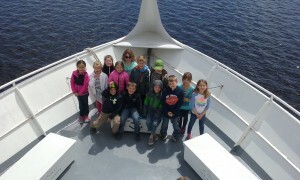 The picture above shows the second graders enjoying their cruise around the harbor! I hope you all have a safe and fun summer break!! Can you believe it is almost May? We are almost done with school for the year. The students are very excited about this of course! Tomorrow our First Communion, I am so proud of all the hard work that the students have been doing throughout the year! Thank you for all that you do with them at home and for keeping them so excited about the Eucharist! This week we have been learning about engineering in Science. The student have each built a house for the “4th Little Pig” who needs a house that will withstand the wind from the Big Bad Wolf. They created a blueprint, started building, tested their house several times and are now creating an advertisement to “sell” the houses they built. Above are some pictures showing the students hard at work building. We are very busy in second grade! We just wrapped up our economy unit in Social Studies and are moving onto Science. The students are excited to begin learning about mass and matter. We are also finishing up our money unit in math. The students are very good at working with money. We had a classroom store last week and they had fun buying things with the money they had earned. First Communion is almost here! I am so excited to share this experience with the students and I know they are excited too! Thank you for all that you do to help prepare your children for this special event. Keep working on those booklets, they are due April 14. 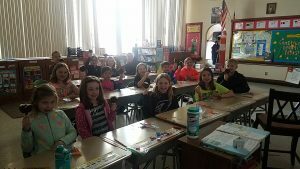 The second graders are enjoying the healthy snacks that will be provided for the month of March to promote healthy living. Lakewood health system is helping to provide the snacks for our school. So far the students have enjoyed oranges and grape fruit! They are excited to see what fruit or vegetable they will get next! 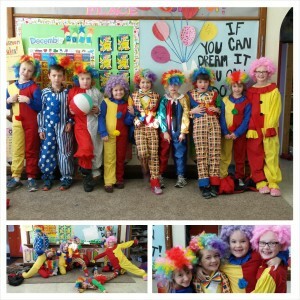 This week the students are having so much fun celebrating Catholic Schools Week! 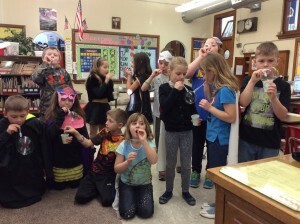 In the picture above the students are showing all the ways they can make bubbles. They had a great time! This week we played games in all the classrooms, had a Kryptonite Game on the playground and even got a visit from the Science Guy today. The students had a blast learning that “It’s not magic…It’s SCIENCE!” They learned a lot about air pressure and oxygen. All the Superheroes are ready to dance the night away tonight at our Superhero Dance! I hope to see you all there. They are also very excited for the Carnival this weekend!! 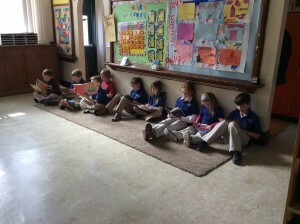 As the end of quarter approaches the second graders are staying very busy. In math we are wrapping up our unit on fractions by making “Fraction Bots” to show our understanding of parts of a whole. We are also transitioning into Earth Science to learn about weather and how to measure different aspects of it. The students’ are looking forward to the Carnival and Catholic Schools week! The students in second grade have been very busy. In math we are working on plane shapes and making patterns. The students love creating new shapes and extending patterns with our pattern blocks. We also created a Nativity scene for our bulletin board (pictured above).We are working hard to learn our songs for the Christmas program. They are doing great! We are also learning a lot about Advent and are completing a treasure hunt as a school. We have learned about Jesus’ family tree, Mary’s love and the town of Bethlehem. I hope to see you all next week at the Christmas program! Can you believe it is almost Thanksgiving? It seems like we just celebrated Halloween! 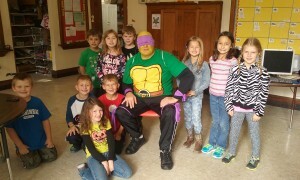 Above is a picture of the second graders with our lunch guest, Ninja Turtle Doug. We had a lot of fun celebrating Halloween this year. This week we are reading “Turkey’s Thanksgiving”, making some Thanksgiving crafts and talking about celebrating holidays together. Hello parents! This week we have been having a great time in second grade! 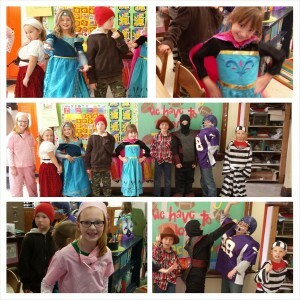 In reading we are doing a play and the student are having a great time practicing and making their costumes! Soon, they will perform for the first grade class. We are working with data and graphing in math. The students really enjoy practicing graphing on the floor! Hope to see you all next week at the Halloween dance! Can you believe September is almost over?! We have had a wonderful first few weeks of school here in second grade. We jumped right into working on our reading skills, reviewed our math skills, and began learning about our communities in social studies. We have also had several fun activities. We received a visit from The Cardinal and the homecoming court to celebrate the homecoming festivities! We also got to watch the parade and cheer for the many high school activities that were represented. 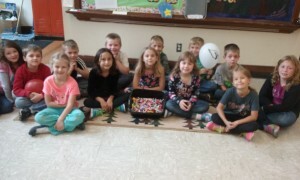 Check out how much candy we caught! (Pictured above) We kicked off the workathon last week. The students are so excited to raise money for the school and to support the community at our workathon! It is already May! 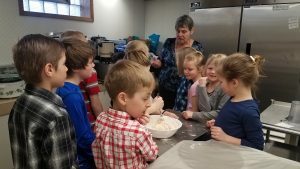 This weekend the second graders had their First Communion celebration. I am so proud of how hard they have worked this year and everything that they have accomplished. This week we are learned about inflected endings in English, 3-digit subtraction in Math, and are learning more about the American Flag in Reading. The students are very excited about all of their projects for AAA and are also super excited for our field trip to see the Twins on Thursday! On Wednesdays the students have been doing some journaling with our classroom visitor Mrs. Hanson (pictured above). We have been working on our writing skills as well as learning the importance of journaling. I hope to see you all Wednesday night at the AAA program and Parent Appreciation night! Fourth Quarter is here!! 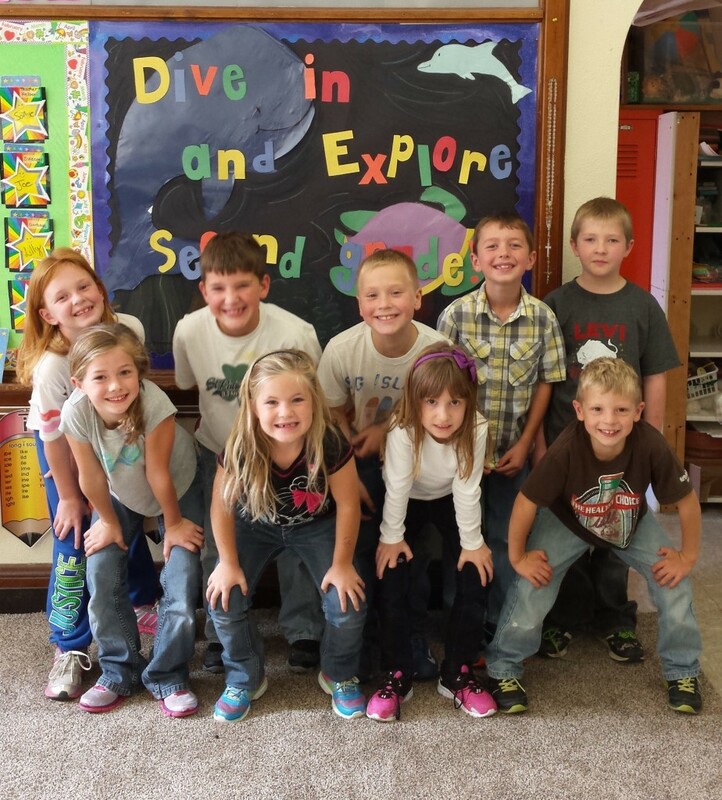 It is hard to believe that we are already near the end of the school year. The second graders have been very busy the last few weeks. In math, we finished our unit on money and time. 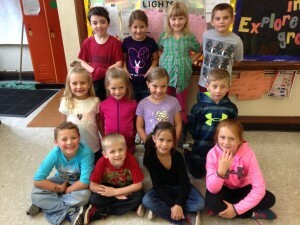 They were able to create their own classroom economy where they earned money each day. The students were then able to save or spend their money throughout the week and at our classroom store. We had a blast! In English we are working with pronouns. We are learning when to use I versus me. We are also getting ready to begin our Spring Blast project! The students are very excited to get to work on this. We love to READ! Thank you to everyone who participated in last month’s I Love to Read challenge. The students had a great time finding books for each day and reading them. This week we finished up our unit four in reading. We worked on making life cycles to understand how things change and made time lines to see the changes in our own lives. In math we are just starting to work with money. We reviewed the worth of different coins and practiced counting on to a dollar! The students are really excited to start our Classroom Economy project next week. Students will get a daily “career” and daily “salary”. They will have opportunities to save and lose money as well as buy objects or rewards throughout the week using the money they make each day. We will be doing this activity for two weeks. At the end of the week they will be able to use the money they saved to purchase something at our classroom store! This will be a fun way to help the students understand the value of money and begin to see how saving and spending works. Thank you to everyone who helped make the carnival such a success! The second graders had a blast and are already excited for next year! We are finishing up two-digit addition, and next week we will start with subtraction. In reading we are learning about the life cycle of plants as well as writing some poetry. The students are having fun using strong adjectives to describe the things around them. In Social Studies we are learning about the difference between wants and needs. The second graders had a blast doing Catholic Schools Week and the Carnival but are ready to get back to a normal schedule! Welcome Back! We have been very busy in Second since getting back from our Christmas break! I hope everyone had a wonderful Christmas and New Year . 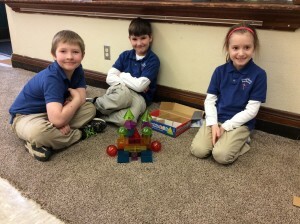 Last week we began to work with solid shapes…and of course had some fun making castles with the shapes as well! We also worked with the long i sound and compound words in Reading and Language Arts. This week we began discussing comparative endings as well as doing some comparing and contrasting in our writing. In math we have started to work with fractions. Merry Christmas!! Thanks to all of you who came to see our Christmas program this year! 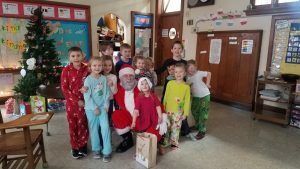 The kids had such a blast! I am so proud of all their hard work! This has been a crazy week between performances and the excitement for Christmas break. We have been doing a lot of review in math and have been working with compound words in reading. I hope everyone has a wonderful break and a great Christmas! 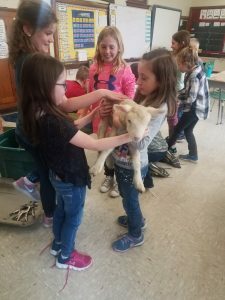 It has been an exciting couple of weeks here in Second Grade. This week we were in charge of the Mass parts for the first time this year. The students really enjoyed this and did a great job reading! As we head into the Advent season, the second graders are also getting prepared to receive the Sacrament of Reconciliation. They will be receiving this next week. Please keep them in your thoughts and prayers as they get ready for this important and exciting experience! We are also beginning to learn about plane shapes in Math which the students are really enjoying. In Reading we have been working with the long a, and long e sounds. We are also learning about consumers and producers in Science, and the students are working hard to understand food webs. 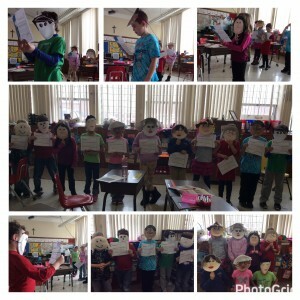 We have been practicing our songs for the Christmas Program as well. I hope everyone had a fabulous break! Thank-you to all of my parents who came to parent-teacher conferences! It was great to sit down and talk with all of you and get your feedback on how the year is going so far. My class is already super excited to start working towards their AR goals again. 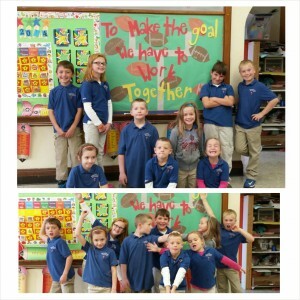 Our goal class goal is to get 4 points and they each made their own individual goal to challenge themselves as well. We are also going to try to pick AR books that are at their levels. We finished Chapter 4 in math this week, and will be reviewing the first four chapters next week before they take their Unit 1 test. This week we have been preparing of our Veteran’s Day program! We will be reciting some poems with the 1st grade class, we have been having a great time so far. The students are excited to do this next Tuesday. In reading next week we are going to be doing a little play which I hope the students will enjoy! Thanks again for coming to conferences, please let me know if you have any questions or concerns! Above are a couple pictures from our Halloween fun! Hello parents! This week we have started our new unit in reading on Working Together. To kick-off our week we created a new bulletin board for our classroom! This new board is pictured above. We have also started working with surveys in math. 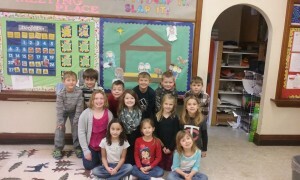 The class had fun visiting the first grade room to ask them some questions! I hope everyone enjoyed their long weekend! Also, Thank-You to everyone who came to our Reconciliation meeting! Remember, YOU are your child’s first teacher of Faith! It is already the middle of October, can you believe it?? This month has flown by so far! Our class has just finished our first unit in reading about Exploration. We were able to learn about exploring new places and things. We are going to be starting our new unit, about Working Together, when we get back from MEA break. To get the students excited for this, we came up with a new bulletin board idea to replace our aquatic exploration one. We will be putting this up early next week, feel free to drop by and check it out! 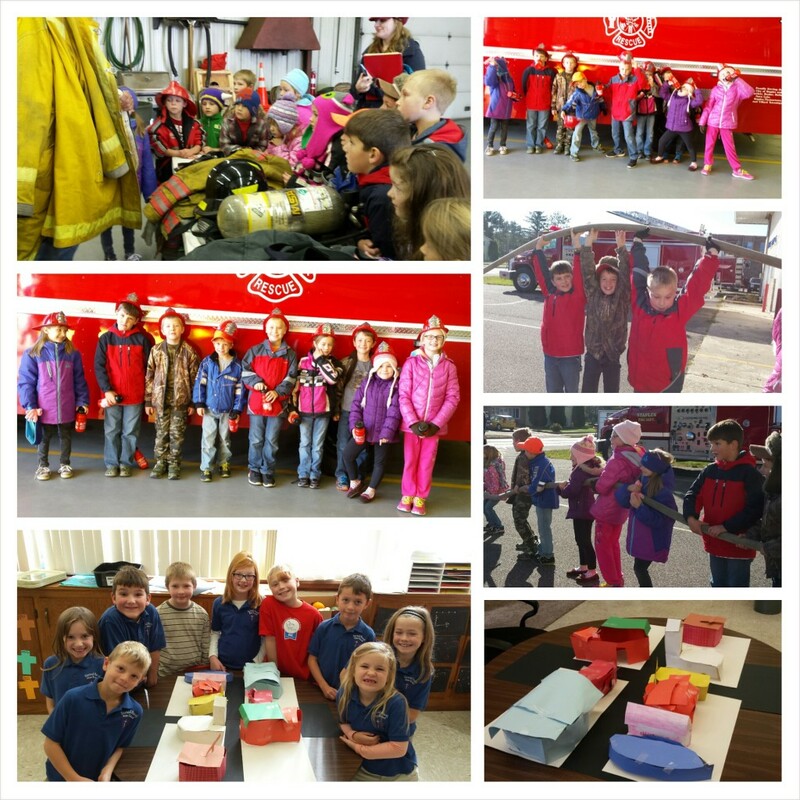 Last week we were able to go the fire hall to learn more about fire safety. The kids had a blast learning about the tools used, the different types of gear used, and spraying the ambulance down with the fire hose! Last week we began our unit on communities in Social Studies. We also talked about maps and the cardinal directions. As a class project we created a 3-D representation of two blocks of 4th street, from our school to the movie theater. This project is pictured above. We have been very busy this month, but we are also having lots of fun! Enjoy your long weekend! Don’t forget there is a 1st Reconciliation meeting on Oct. 22 at 6:30 p.m in the Sacred Heart Church basement. See you then! As we begin our fourth week of school all of us in the second grade room are slowly getting used to being back in school and are getting into our daily schedule! 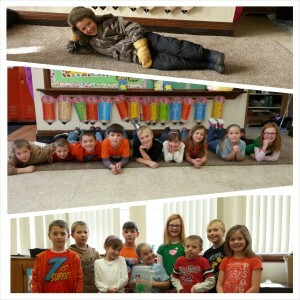 The first week flew by in a flurry of get-to-know one another activities…mostly for my sake! We created a classroom puzzle to show that we are all different, but together we make a beautiful picture! We had a lot of fun getting to know one another, coming up with our classroom rules and preparing for an exciting school year! 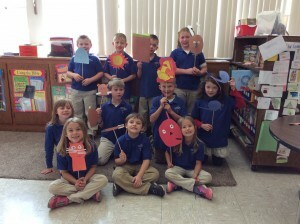 The second week included jumping into learning by exploring short vowel sounds, practicing ordering numbers in math, and talking about The Sacraments. The students are very excited to begin learning about Reconciliation as well as First Communion so that we are prepared to receive these Sacraments later this year. It has been a great start and I am excited to spend this year getting to know my students as well as all of you!